The opener’s pitching matchup was a doozy: Luis Severino vs. Chris Sale. Well, it was supposed to be a doozy. Instead, the Yankees bats took it to Sale while Severino pitched well. Boston’s ace gave up four homers: one to Aaron Judge, one to Tyler Austin, one to Didi Gregorius, and one to Aaron Hicks. They tallied six runs in total against Sale and added three more against Boston’s bullpen, which was plenty of run support for Severino. One of those runs was a Gary Sanchez home run, his 43rd, which set the single-season record for catchers. The Yankees’ ace gave up two runs in six innings and struck out nine batters. A nice way to set the tone and boost the division lead to two and a half games. Game two featured the Sonny Gray we’re accustomed to witnessing in real life. Instead of his usual excellent virtual self, Gray got knocked around in this one. He put the Yankees down early, as the Red Sox rallied for four runs in the first en route to scoring seven total against him. Nonetheless, the Yankees bats fought back against Steven Wright and Boston’s bullpen. Down 7-1 late in the game, they tallied four runs in the seventh behind Greg Bird and Aaron Hicks long balls. Unfortunately, it was too little too late, as Boston was able to make it with a lead until the ninth when stalwart Craig Kimbrel shut the door on a 7-5 Boston victory. The rubber game’s pitching matchup, Madison Bumgarner vs. Brian Johnson, clearly put the Yankees at an advantage. The game doesn’t always go the way it looks on paper, but in this instance, it sure did. Bumgarner dominated in seven innings of work, stifling the Red Sox to just one run. Meanwhile, Johnson was knocked out of the game in the third inning. There were home runs aplenty, including Giancarlo’s 51st and Sanchez’s 44th and 45th. In the end, the Yankees’ mop up relievers (Chance Adams and Gio Gallegos) gave up three runs, but with such a large cushion, there wasn’t much concern. The Yankees came out on top, 8-4. All told, the Yankees added a game to their division lead and closed the series up two and a half games. One piece of injury news to report: in the final game of the series, Chance Adams was pulled because of an injury. Before the next series against Baltimore, he was diagnosed with a torn labrum, which will sideline him for a year. The series opener was rained out, meaning a doubleheader was set for Saturday. Boston won a game in the meantime against Cleveland, which cut the Yankees lead to two games. Shouldn’t be a concern though, right? 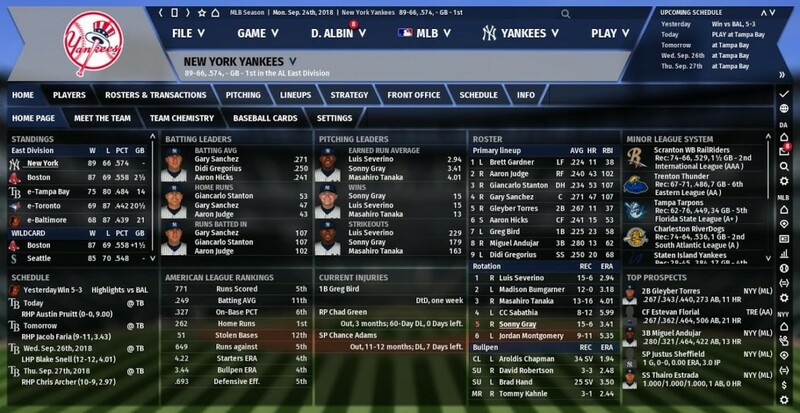 With Baltimore in town, the Yankees should have no issue taking care of business. Sometimes, though, you run into a great pitcher like Chris Tillman. Over seven innings, he allowed just one run to lower his sky-high ERA to 5.97. Masahiro Tanaka did not pitch well in the loss, though Justus Sheffield made his big league debut and threw three scoreless innings in long relief. The final score was 5-3, though it never felt quite that close as the Yankees were down 5-1 to open the ninth. The nightcap was much better. The Yankees absolutely destroyed Baltimore’s pitching, scoring 20 runs. That’s right, 20. But it was more than just an offensive display, as CC Sabathia was absolutely brilliant in perhaps the final start of his virtual career. He threw a complete game and allowed just one run. He struck out seven Orioles. Boston lost its Saturday game, bringing the Yankees advantage back up to two and a half games. One final piece of housekeeping: Greg Bird was suspended for four games as a result of a benches-clearing brawl in this game. He charged the mound after Branden Kline drilled him. To close out the series and the week, the Yanks turned to their ace, Luis Severino. This one wasn’t Sevy’s finest outing, but he battled through five innings and allowed three runs. In relief, the bullpen was excellent, and the offense finally broke through the 3-3 tie in the eighth inning. Aroldis Chapman got the save chance, his first outing of the week, but didn’t show any rust while pitching a 1-2-3 inning to seal the victory. The Red Sox maintained the pace by beating Cleveland. Boston came to the Bronx to open this week for perhaps the biggest series of the season. Only a game and a half separated the two squads to start the week, but by the time it ended, the Yankees increased their division lead to two and a half games. The Yanks and Sox exchanged wins in the first two games of the week, but in the rubber game, Madison Bumgarner and the offense lifted the team to victory and come away with a series win. Against the Orioles, it also took until the third game to win the series, but the Yanks did just that while Boston did the very same against Cleveland. All told a successful week given that they added space in the small separation the team has from Boston.